Cedar Valley Winery - Fairfield, Iowa - Tune into our Vibe! Cedar Valley Winery features French and American hybrid varieties, producing high quality, award winning wines. 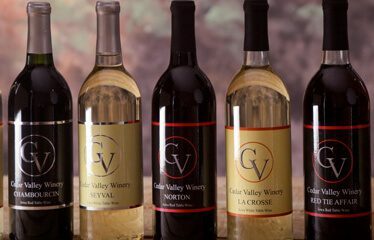 Focusing on quality, the Cedar Valley Winery produces estate grown and estate bottled wines from grapes grown exclusively in their Vineyard, 10 minutes west of Fairfield. The small 1.5 acre Vineyard initially established in 2002 has now grown to more than 6 acres in size, spanning over southeast Iowa ’s beautiful countryside. Cedar Valley Winery’s annual wine production of approximately 2,000 gallons continues to increase each year. Visit their Tasting Room, tour the Winery, and enjoy their favorite wines on the outdoor deck overlooking the beautiful Vineyard. Sophisticated serenity awaits you.